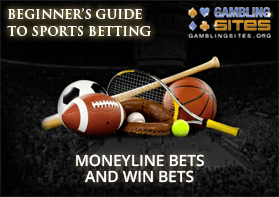 What Are Moneyline & Win Bets and How Do They Work? Understanding different types of sports bets can sometimes seem overwhelming to people. The reason for this, though, is not because the bets are actually confusing at all. It is because they are usually explained by a friend, or a website that is not well written and key components of the explanation are left out. Thankfully, we're going to make sure that once and for all, you understand one of the most common types of sports bets available. You'll quickly see that sports betting is a lot easier to understand and participate in than most people give it credit for. What is a Moneyline/Win bet? Basically, all you are doing is selecting which team or person is going to win an event. As we said earlier, you may have already made this type of bet before without even knowing it. If you ever bet your friend a few bucks that a certain team would win a game, you made a moneyline/win bet. Winning or losing a moneyline bet only depends on if the team or individual wins the game or event or not. It does not matter how many points or how decisively they win the game by. Let's say the Dallas Cowboys are playing the Green Bay Packers during Monday Night Football and you think the Cowboys are going to win. If you place a moneyline bet on the Cowboys, you will win your bet if the Cowboys win by one point or if they win by 100 points. If the Packers win by any amount of points, you lose your bet. This is the same for sports where you have individuals instead of teams competing. For example, if you make a moneyline bet that Roger Federer will win his next tennis match, you will win your bet when he wins and lose your bet when he loses. It does not matter how he wins or by how many sets he wins. A win is a win, and a loss is a loss when it comes to moneyline bets. How Do Moneyline Bets Payout? As you may have already suspected, all moneyline bets are not created equally. Different moneyline bets will pay out different amounts depending on who is competing. Let's look at an exaggerated example to show you why. Let's say that Mike Tyson, one of the greatest boxers of all time, is going to fight a boxing match against a six-year-old kid. Would it be fair to pay a bettor the same amount if they picked Mike Tyson to win than if they picked the doomed six-year-old to win? Of course, it's not. If that were the case, everyone would bet all of their money on Mike Tyson and the sportsbook would be broke the next day. Moneyline bets payout dependent on how big of a favorite or underdog the person or team you are betting on is. The bigger the favorite the team or person is, the less money you will be paid on a winning bet. The bigger the underdog the team or person is, the more money you will be paid on a winning bet. The amount that you are paid for a winning selection is decided by the casino and made public before you make your bet. These are depicted with a plus or minus sign and then a number that shows how far in each direction. If that's confusing, it will make a lot more sense with some examples. You might hear people refer to this as the line. (The line is also commonly used to refer to the point spread which we will address in a later post). If a team has a plus (+) sign in front of their name, they are an underdog. If a team has a minus (-) sign in front of their name, they are a favorite. The larger the number next to the plus or minus sign, the more significant of a favorite or underdog the team is. For example, here are a few sample lines from an actual sportsbook that we will use for an example. In this example, the Buffalo Bills, Jacksonville Jaguars, and the St. Louis Rams are all favorites. The Rams are the biggest favorites, and the Bills are the smallest favorites. The Carolina Panthers, Tampa Bay Buccaneers, and New Orleans Saints are all underdogs. The Saints are the biggest underdogs, and the Panthers are the smallest underdogs. How Do I Figure Out How Much Money I'll Win On a Moneyline Bet? If you've been following along half asleep, now is the time to turn up that attention. This part isn't that confusing, but it is the part that most people usually get lost on. Don't worry, though. We are going to take it slow and walk you through it step by step with plenty of great examples. You'll be an expert teaching everyone else in no time. The amount that you win or lose on a moneyline bet is set by the plus or minus sign and the number that is attached to it. Let's start with the times that we are the underdogs. As we already know, when we are the underdogs we are going to get paid more than a standard even bet. If you've ever bet with friends, you probably bet like this..."If my team wins, you owe me $10. If your team wins, I owe you $10." Regarding a moneyline, that would look like either +100 or -100. The number after the plus sign is the amount we will win for every $100 we bet. So in our bet with our friend, for every $100 we bet, we will win $100. This is an even money bet. Let's pull up our football lines from earlier to look at a few more examples. If we were to bet $100 on the Carolina Panthers, we would get paid $105 for a winning bet. If we were to bet $100 on the Tampa Bay Buccaneers, we would get paid $110 for a winning bet. If we were to bet $100 on the New Orleans Saints, we would get paid $135 for a winning bet. This does not mean that you have to bet in even increments of $100. If you bet more or less, it will just follow the same ratio of payouts. We can divide the number by 100 and get the amount we will get paid for every dollar we bet. For example, let's look at a few different bet amounts on the New Orleans Saints. Currently, we already know that if we were to bet $100 on the New Orleans Saints, we would get paid $135 for a winning bet. If we wanted to figure out how much we would get paid per $1 bet, we would divide the moneyline number by 100. 135 divided by 100 equals 1.35. We would get paid $1.35 for every $1 we bet. If we were to bet $50 on the New Orleans Saints, we would get paid $50 times $1.35, or $67.50 for a winning bet. If we were to bet $250 on the New Orleans Saints, we would get paid $250 times $1.35, or $337.50 for a winning bet. Let's take a look now at what a moneyline bet would pay out if we are a favorite. As we already know, when we are the favorites we are going to get paid less than a standard even bet as we are probably going to win our bet more often. The number after the minus sign is the amount you have to bet to win $100. Let's pull up our football examples again to make this a bit clearer. If we wanted to win $100 on the Buffalo Bills, we would have to bet $125. If we wanted to win $100 on the Jacksonville Jaguars, we would have to bet $130. If we wanted to win $100 on the St. Louis Rams, we would have to bet $155. As you can see, we have to wager more money for the same payout the bigger favorite the team is. Again, this does not mean that you have to bet in $100 increments. If you'd like to find out the amount you will win on other sized bets, you need to figure again out the amount you will win per $1 wagered. As an underdog, we divided the moneyline number by 100 to get that amount. As a favorite, we have to do it slightly differently. We need to take 100 and divide it by the moneyline number. For example, if we wanted to figure out how much we would win for each dollar wagered on the St. Louis Rams, we would take 100 and divide it by 155 which would give us roughly $0.65. This means that for every $1 we wager, we will get paid a profit of about 65 cents. If we were to bet $50 on the St. Louis Rams, we would get paid $50 times $0.65, or $32.50 for a winning bet. If we were to bet $250 on the St. Louis Rams, we would get paid $250 times $0.65, or $162.50 for a winning bet. Remember these are the profit number on a winning bet. You do receive your original wager back as well. For example, if you made the most recent bet we talked about for $250, the casino isn't going just to hand you $162.50. That would be a terrible deal for you. They are going to hand you $250 plus $162.50 for a total of $412.50. The $162.50 is the amount that you profited on your bet. This is the case regardless of if you are betting on a favorite or an underdog. The bottom line is that the odds all indicate your profits relative to a 100 unit base figure. When your team is a favorite, the number after the minus sign is how much money you have to bet to win $100. When your team is an underdog, the number after the plus sign is how much money you win for every $100 you bet. Up until this point, we have been using the whole number format for moneyline bets, also referred to as the American odds format. This format is the format you will see for betting odds in the United States predominately and online in a lot of sportsbooks. In most other areas of the world, you will see what are known as decimal odds. Here is what the same line would look like in both formats. These lines mean exactly the same thing. We already have talked about the specifics of American Odds and how to calculate your payouts with them. Now let's walk you through everything you need to know about decimal odds and how to calculate your payouts. The decimal odds represent the amount that you will win, including your original bet for every dollar wagered. In other words, this is the total amount that you will be given back by the sportsbook if you win your bet. So in the above example, if you bet $1 on the Cowboys and they won, you would receive $1.68. $1 of this would be your original bet, and the $0.68 would be your profit. If you were to bet $1 on the Packers and they won, you would receive $2.30. $1 of this would be your original bet, and $1.30 would be your profit. As you can tell in this example, the Cowboys are the favorites to win the game. A completely even money bet would be 2.0. This means that if you bet $100 on this bet, you would profit $100. The sportsbook would give you your original $100 wager back, plus your $100 profit. Any team with a decimal odds number greater than 2.0 is going to be the underdog, and any team with a decimal odds number less than 2.0 will be the favorite. The only exception to this is the straight up bets where the sportsbook puts both bets at the same odds and adjusts for their juice (which we are about to discuss. You might be starting to wonder how the sportsbook makes any money off of this. You also might be assuming that the sportsbook is just gambling against you. This is actually not what is going on. What the sportsbook tries to do is get the same amount of money bet on each side of a game and then takes a small percentage from all of the payouts. Let's break down both of these points one at a time, to make them more clear. This means that regardless of which team you bet on, you will receive $90.91 for a winning bet. The sportsbook takes about 10% off the top of every winning ticket. This is known as the house juice and is effectively how the sportsbook makes its money. As a continuation of the above point, the sportsbook is always going to want to get an even amount of money on both sides of the bet. Let's say in our above example that $1000 comes in on the Cowboys and $500 in bets comes in on the Packers. $1500 - $500 - $454.55, or $545.45 in profit |A great day for Packers fans and a great day for the sportsbook. $1500 - $1000 - $909.10, or $409.10 in losses | A great day for Cowboys fans, but an awful day for the sportsbook. As you can see, one of these scenarios is favorable for the sportsbook, and the other is not. For this reason, the sportsbook will try and bring in the same amount of money on each side if the bet is even. Here's the same scenario if the casino brings in $1000 on both sides of the bet. The sportsbook couldn't care less who wins this game, and that is how they like it. The smaller guaranteed profit is how they like to operate. If the lines are not even, it gets a bit trickier for the casino as they will need more bets on one side, but the guiding principle is the same. They try and get the correct amount of bets on each side so that no matter who wins, they profit. The way the sportsbook does this is by shifting the moneyline to make one side more enticing and the other less enticing. For example, let's look at our above example where too much money was coming in on the Cowboys. The sportsbook might shift the line to something like -130 for the Cowboys and shift the line to something like +110 for the Packers. This will make more people, and more money starts coming in on the Packers as you will now be getting a much better payout if the Packers win. Subsequently, you will be getting a worse payout if the Cowboys win and have to risk more money to get the same payout. The sportsbook will continually shift these lines back and forth if need be to try and get the amount of money they want on each side. It doesn't always work out perfectly for them, but that is not going to affect you as a bettor at all. If you'd like to learn more about the sportsbook juice, here's a great link that goes into a bit more detail on the topic. When it comes to ties, it will all depend on the sport you are betting on and the sportsbook you are betting at as to how the tie will be handled. Typically, if you are capable of betting on a tie, then the other two win bets would be losses in the event of a tie. If it is a sport where you are not capable of betting on a tie, both bets would typically be a push, and you would receive all of your money back with no profit or loss. Sports like soccer allow patrons to bet on ties and most sportsbooks treat these as losses if you bet on a team to win. Sports like football, you cannot bet on a tie (except as a prop bet), and therefore these bets would be treated by most sportsbooks as a push. If you bet $100, you would get your $100 back. Just because this bet is so simple does not mean that it can't be a profitable bet for you. The professional bettors use this bet on a daily basis to support their livelihood. Remember, how complicated a bet is has nothing to do with how good the payouts are going to be. For some reason people like to over think this and they believe that there are special complex bets that are only available to seasoned sports bettors. This is simply not true. If you'd like to look into some specific strategies to help maximize your winnings with moneyline bets, here's a great guide we've put together for you to check out.